If a certain number is increased by x% then decreased by x% or vice versa, the net change is always decrease. This change is given by a simple formula −(x10)2= −(1010)2= −1%. Negitive sign indicates decrease. 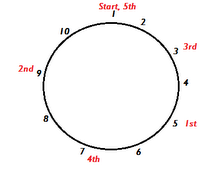 The faster cyclyst comes to the starting point for every 4 min so his times are 4, 8, 12, ......... The slower cyclist comes to the starting point for every 6 min so his times are 6, 12, 18, ......... So both comes at the end of the 12th min. 11. M, N, O and P are all different individuals; M is the daughter of N; N is the son of O; O is the father of P; Among the following statements, which one is true? 27. A father purchases dress for his three daughter. The dresses are of same color but of different size .the dress is kept in dark room .What is the probability that all the three will not choose their own dress. 28. N is an integer and N>2, at most how many integers among N + 2, N + 3, N + 4, N + 5, N + 6, and N + 7 are prime integers? 30. Given the following information, who is youngest?